The panel of speakers at the screening of Bridging the Divide: Tom Bradley and the Politics of Race in the Armer Theatre. 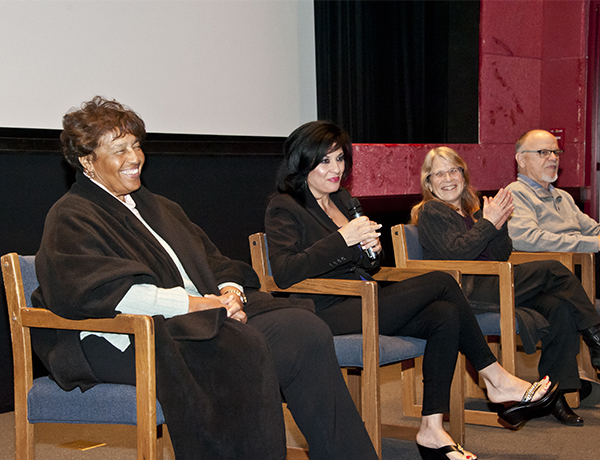 From left: Lorraine Bradley, Tom Bradley’s daughter; Alison Sotomayor, co-producer; Lyn Goldfarb, co-producer; and Kent Kirkton, director of the Tom and Ethel Bradley Center at CSUN. Photo by David Hawkins. The daughter of legendary Los Angeles Mayor Tom Bradley was among a panel of experts who talked about his extraordinary life, during an event that kicked off Black History Month at California State University, Northridge on Monday, Feb. 1. “Perhaps this film will ignite the fire. … Spark an interest in the next leader,” said Lorraine Bradley, after a screening of a film about her father’s life, Bridging the Divide: Tom Bradley and the Politics of Race, in CSUN’s Armer Theater. CSUN political science major Zakiyyah Babatunde-Bey said she was inspired by the film. “Everyone should see it,” she said. The film chronicles the life of Bradley, the first African-American to be elected as mayor of a major U.S. city with an overwhelming white majority. His extraordinary multi-racial coalition redefined Los Angeles, ushered in police reform and transformed American politics. Bradley’s daughter was joined by the film’s producers, Alison Sotomayor and Lyn Goldfarb, and Kent Kirkton, the director of the Tom & Ethel Bradley Center at CSUN, during a panel discussion. Lorraine said telling her father’s story is part of the mission of the Tom and Ethel Bradley Foundation. The foundation partnered with CSUN last year to form the Tom & Ethel Bradley Center at CSUN. The center has continued the work of the Institute for Arts & Media to preserve the visual history of Southern California, but will have a renewed focus on the years when Tom Bradley served as Los Angeles’ mayor, from 1973 to 1993. The center’s online, digital collection can be accessed through the Oviatt Library website. Sotomayor and Goldfarb said they decided to produce a documentary on Tom Bradley in 2008 during Barack Obama’s campaign for president. They were surprised to discover there were no documentaries, scholarly biographies or substantive interviews about Bradley, who died in 1998. “Tom Bradley laid the foundation for the kind of coalition politics that allowed President Obama to be elected,” Goldfarb said. The event, which was sponsored by the Department of Art, Department of Cinema and Television Arts, Department of Africana Studies and the CSUN Black Alumni Association, was the first of several events planned for Black History Month. For more information about Black History Month events, contact the Department of Africana Studies at (818) 677-3311.